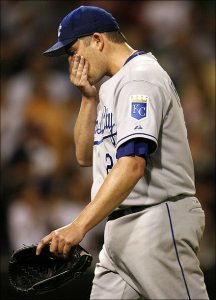 In July of 2006, one of the hottest debates in baseball focused on the perennially last-place Kansas City Royals. The team was back in the cellar, and with the All-Star break approaching, the question became: Do we REALLY need every team represented on the damn All-Star team? Who could possibly go to PNC Park to rep the Royals? The AL Central, like the NL Central, lacks the star power of the East and West divisions. No New York or LA teams make the central divisions rather…well..bland. Not that they don’t have talented teams. The Cardinals and White Sox each have a World Series victory within the last decade, which is more than you can say for the high profile, high payroll teams from LA. It’s just rare that you hear anyone mention anyone from either central division as the front runner for the Pennant. But this year the popular pick in the AL has to be the Detroit Tigers. Less than a decade removed from a 43 win season that ranks as one of the worst in baseball history the Tigers have turned into a perennial contender. But they also did it the right way. They didn’t use Moneyball tactics. They didn’t drown the rest of the division in piles of money. They drafted properly, hired quality personnel, spent on free agents wisely and judiciously, kept their own players and let go of players that had outlived their usefulness. As a Pirates fan, I am truly envious. And we miss Jim Leyland. All of us.